Notes: Remains of a cairn which was largely destroyed in the early 19th century when material from it was removed for road building. 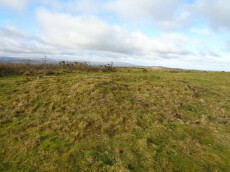 Now a turf-covered mound 20.5 metres diameter and 0.6 metres high. Notes: Turner A36. " Stone ring with central cairn. Outer ring measures 12.0 metres in diameter with bank 1.5 metres wide and 0.3 metres high. Central cairn 5.0 metres in diameter and 0.4 metres high with disturbance on its western side. Outer ring has 2.5 metre wide entrance on the east." Notes: Turner E9. 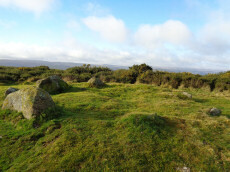 Platform circle consisting of a ring of kerb stones, measuring 7.0 metres in internal diameter, enclosing a flat-topped cairn 0.3 metres high, with boulder incorporated into perimeter. 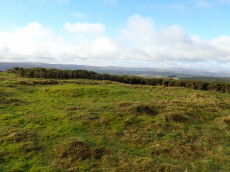 Notes: Mardon Down stone circle is the biggest by circumference on Dartmoor with a diameter of 38m. 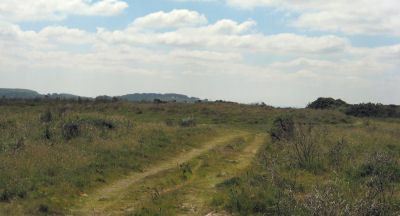 The site would have been impressive in its day and is one of the only ones sited on the top of high ground and has a fine view of the surrounding area. Today the circle is fairly dilapidated. Six stones remain upright and another 16 lie roughly in place. There are two massive megaliths one of which is on the north-western part of the circle. A short arc of seven stones remains in position on the south-east of the circle. The circle was first described by Dr Milles in 1772 who reported around 70 stones. Butler suggests it probably originally consisted of around 61 stones many of which are probably buried under the peat where they originally fell although some have no doubt been robbed out. Notes: NMR C. Cairn 32.0 metres south-east of Giant's Grave. 11.0 metres diameter, 0.7 metres high with traces of a retaining circle on the south-west side.